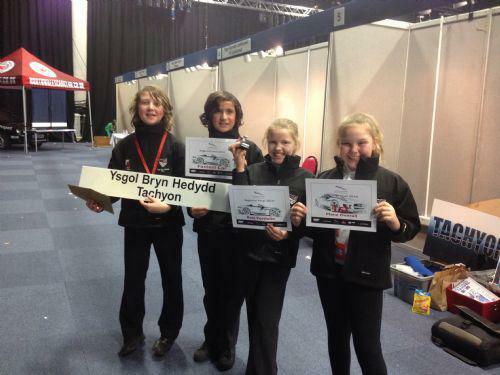 Huge Congratulations to our F1 In Schools team 'Tachyon' who won not only, 'Best Portfolio and Pit Display'... and the 'Fastest Car' award, but they were also crowned North Wales Champions at the regional finals in Venue Cymru on Monday! The team which consists of, Issy Langford, Daisy Brett, Levent Gundogan and Ellis Payne, were selected to form the official F1 team to represent YBH, after they all showed strengths in different areas during our whole year 6 F1 project in October last year. Team Tachyon were outstanding on the day, and demonstrated not only their knowledge gained from this STEM project, but also delivered fantastic team work and communication skills on the day. The team will now go to Coventry in June to compete for the title of British 2D F1 In Schools Champions 2014. Anwyl ~ Shoreline Removals ~ Cool Cats ~ 10 10 Systems ~ Open Minds ~ Leader Optec ~ Bluespot Furniture Systems ~ Denmore Stores ~ Llew Jones Coaches ~ Kinmel Paper. Well done team Tachyon and Good Luck!